Played this on 27th January with my regular sparring partner, John Mitchell. 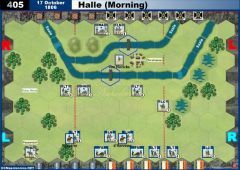 Playing French to begin with, I spent some time moving the troops forward slowly, especially putting the artillery where I could pepper the British positions. 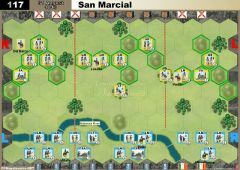 Demonstrations with the cavalry on left (I had some left flank cards to work through) kept the Portuguese in place on the British right, though I took some casualties from their artillery. 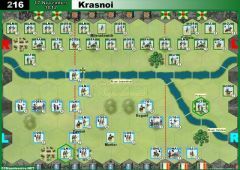 Once my guns were in position, they opened up and battered the advanced British infantry unit on my right. 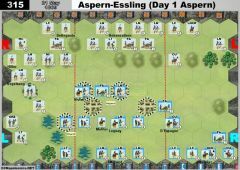 With this out of the way, a rapid advance (aka the Grand Manoeuvre card) put several French infantry units on the hills in its place. 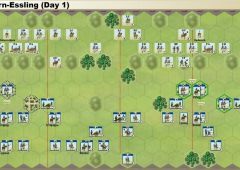 A sustained attack (two Forced Marches and a Bayonet Charge, plus a pause for a Stand and Fire) demolished the British left and half the centre for a 6:1 victory. 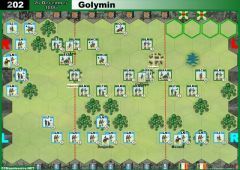 Swapping sides saw John launch an initial French attack on his left with the cavalry. This took out the Portuguese artillery in exchange for the heavy cavalry. The French then advanced in the centre where allied troops had moved to the front of the hills. A bayonet charge pressed the attack home and removed the British artillery. 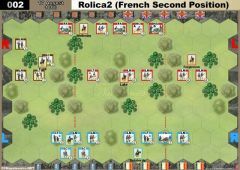 The French took casualties, but were able to retreat several battered units in the face of the British counter attack. Back on the British right, the French cavalry took out the Portuguese militia, but eventually fell to the guns of the remaining Portuguese unit. French forces moved up in the centre and the artillery started shelling the British and Portuguese, forcing then to fall back. The French infantry could then move up unmolested. 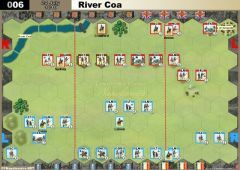 A redeployment of the Portuguese across the river on the right allowed them to take on the few French units holding the French left. 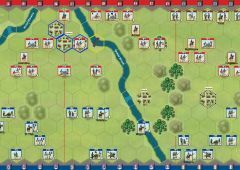 This was too late, though, as a fierce French attack on the centre punched through the remaining British to take the win 6:5. Two out of two for the French and an overall win for yours truly 11:7. Last played with a french attack in the middle with most of iNF regrouped plus 2 Forced March and a Bayonette charge but the dice didn't want: French lost 1/6 ... ! 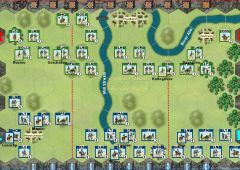 A well balanced and interesting scenario, however if you're playing with a beginner, it's probably best he plays the French as the coalition player has a lot of manoeuvering to do, from what I've seen in the last game I've played. Two very close fights (a friend and I, switching who plays what). British won 6:5 and then 6:4. One battle it was all on the French right flank (mostly against the British) and second time almost all on the French left flank against the Portuguese - who stood up well enough. 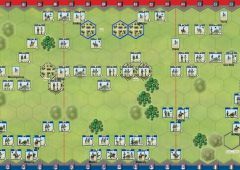 Could have been anyone's game on the 6:5 and on the 6:4 I got luck being attacked by a heavy cavalry unit of 1 remaining block of Portuguese foot while in square (1 block), taking out the heavy cavalry and then also taking out the leader with them.